A 13-year-old cat developed swelling of the left hind leg that did not improve with antibiotic therapy. On presentation, the left hind limb was thickened with marked firm swelling and there was popliteal, inguinal and left medial iliac lymph node enlargement. 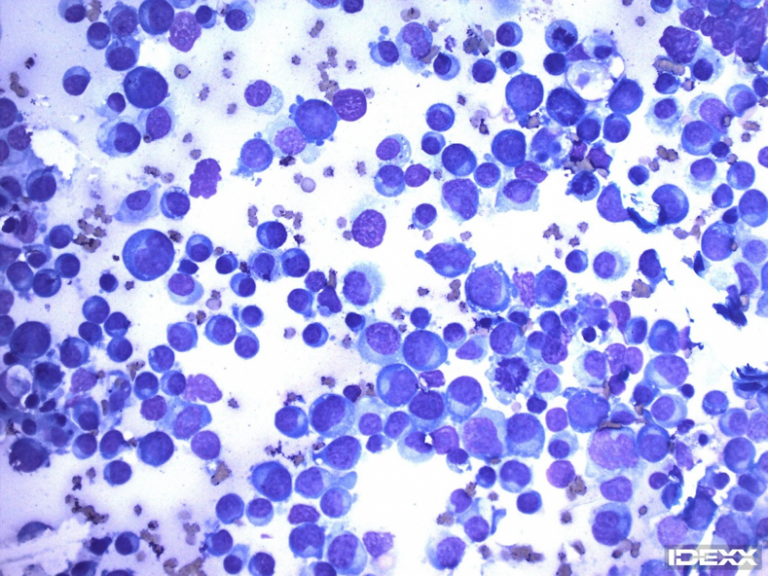 Fine needle aspirate samples for cytology were collected from the left medial iliac lymph node. On abdominal ultrasound, the abdominal lymph nodes were also enlarged. No boney changes were seen. The slides are highly cellular. Most of the cells are intermediate to large round cells. These have round to oval eccentric nuclei with smooth to finely clumped chromatin and variably distinct nucleoli. There is a scant to often moderate amount of deeply basophilic cytoplasm often with a prominent perinuclear clear zone. Occasional to frequent mitotic figures, often bizarre, are seen. Binucleated and multinucleated cells are noted. The cells show moderate to occasionally marked variation in cell and nuclear size. There are low numbers of small lymphocytes that are thought to be from the residual normal population of the lymph node. Blood cells, macrophages, neutrophils and lysed cells are present in the background. No infectious agents are observed. Findings are consistent with malignant neoplasia most consistent with lymphoma (with possible plasma cell differentiation). The diagnosis is lymphoma, intermediate to large cell phenotype. 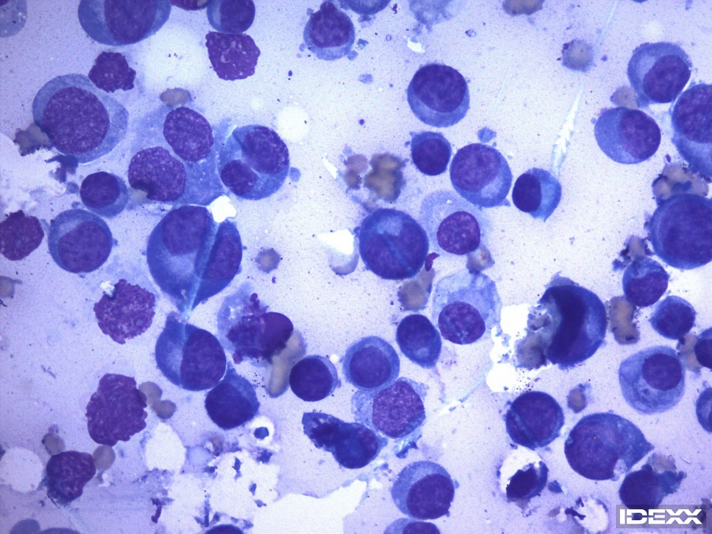 Findings are consistent with lymphoma and this is likely a high-grade lymphoma based on cellular morphology (intermediate to large cell) and high mitotic index. Additionally, given the involvement of the skin/subcutis of the pelvic limb, this may represent tarsal lymphoma. See paragraph below. The patient passed away a few days after the biopsy procedure was performed. Cutaneous lymphoma in cats represents only a small fraction of cases of lymphoma and is generally poorly understood. Cutaneous lymphoma is diagnosed or confirmed and further characterized as epitheliotropic (generally T-cell) or non-epitheliotropic (T or B-cell) on histology. The significance of immunophenotyped (T vs B-cell) is still unclear in felines. Both epitheliotropic and non-epitheliotropic lymphoma can appear similarly clinically and can present as focal, multifocal or diffuse lesions that range from superficial to less often subcutaneous and mass-like. The later has been noted by some to have a predilection for the tarsal region. In a recent retrospective study, tarsal lymphoma in cats was suggested to be an uncommon distinct form of cutaneous lymphoma. Clinically, this is often described as a subcutaneous or mass-like lesion noted near or around the tarsus. It is most commonly non-epitheliotropic and of high grade based on histologic evaluation. Additionally, in this study, most had a B-cell phenotype (significance unclear). Overall, this appears to be an aggressive form of lymphoma with a median survival time of 190 days. Systemic involvement (lymph nodes, internal organs or other skin sites) was identified in many of these cats at the time of diagnosis, time of death or last follow-up. Based on these findings thorough staging is recommended prior to initiating therapy. Burr HD, Keating JH, Clifford CA, Burgess KE. 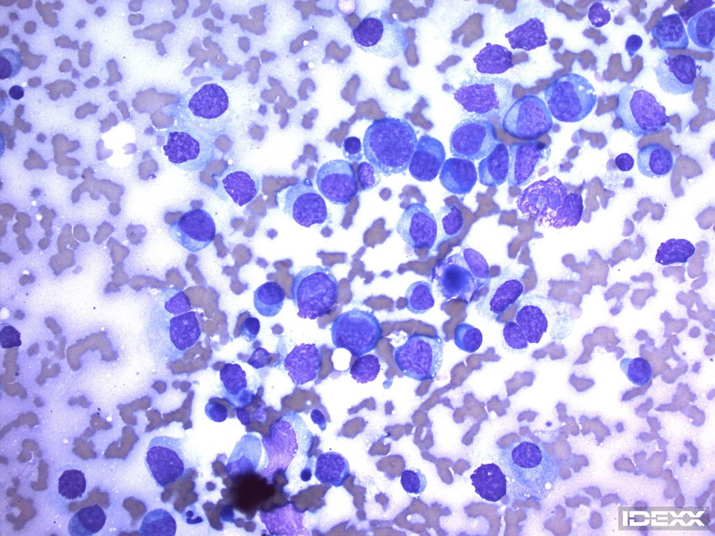 Cutaneous lymphoma of the tarsus in cats: 23 cases (2000–2012). Journal of the American Veterinary Medical Association. 2014; 244(12):1429-1434.